highest bridge in the usa, canon city, co.
11.15.17: officer stops a woman from jumping off the Royal Gorge Bridge. 03.07.18, , canoncitydailyrecord.com, Cañon City Police Department officer who stopped woman from jumping off of Royal Gorge Bridge honored. Officer Sterling Jenkins remembers every detail of Nov. 15, 2017 — the day he talked a woman out of jumping off of the Royal Gorge Bridge. It started when the Cañon City Police Department received a call about the woman, who was standing on the edge of the bridge, sending text messages to her friend that read, "FU, life. I'm going to jump." She had driven all the way to Cañon City from Denver with the intention of ending her life, Police Chief Daric Harvey said. When Jenkins got the call, he already was working on another scene. "He finished that up pretty quickly and went lights and sirens out to the location to make contact with this woman," Harvey said. Once Jenkins arrived, he didn't tackle the woman — "he didn't need to use force," Harvey said. Instead, his training kicked in. He started talking with the woman, ultimately finding out why she was on the bridge and developing rapport with her, "such that she felt comfortable leaving the edge of the bridge and coming off the side," Harvey said. That series of events earned Jenkins the CCPD's Lifesaving Medal in a ceremony Wednesday at John D. Havens City Hall. He was among several officers and employees at the department honored for their work in 2017. For Jenkins, the award came as a surprise. He said he thinks about the incident often. It's something he'll remember for the rest of his life, he said. "I think about, kind of, in two ways. No. 1 because it worked," he said. "That process we're trained to do worked that day. For that, I'm thankful I have the training for that." He added: "I'll always remember her, forever, I'm sure, for the rest of my life. Just that call. I'm so glad that we showed up in time. It would've been a waste if she completed the suicide." Another top honoree from the ceremony was Sgt. Tim Bell, who was named Officer of the Year for his role as administrative sergeant. He moved into the position in 2017. Within the department, he works as the public information officer and as the supervisor of the school resource officers. Harvey said Bell completed the transition to the role with professionalism. "I'm honored. But any one of these guys could've gotten it because of the work that they do," Bell said. "Each and every one of them deserves it." Wednesday's ceremony also highlighted Cindy Foster as Employee of the Year. Though she started in her role in March 2017, Harvey said she has been able to build morale within the office. Additional awards included the Chief's Commendation, given to Pastor Shawn Johnston, Sgt. Corie Ames and Cpl. John Sabatino and the inaugural Administrative Excellence Award presented to Sgt. Andrew Sanders and Deputy Chief Allen Cooper. Unit Citations were given to the records department, which faced a 100 percent turnover in 2016, and the detectives who worked on several high-profile cases last year. Members of the patrol unit also were recognized for their efforts in taking a gun away from a man who was pointing it at his chest in a room at Hildebrand Retirement Center. The team, Ames, Officer Pete Elliot, Officer Lowell Griffiths and Jenkins, were recognized for clearing out the area and successfully de-escalating the situation and assisting the man with getting help. 05.06.17: man dies in bridge jump. 05.06.17, chieftain.com, CANON CITY -- Canon City Police are investigating an apparent suicide after a man jumped off the Royal Gorge Bridge Friday. Police were dispatched to the bridge shortly before 6 p.m. after staff observed a man jump off the west side of the bridge. With the assistance of Fremont County Search and Rescue, the body was recovered and released to the Fremont County coroner, said Cpl. John Sabatino, police spokesman. The victim's name has not been released pending positive identification and notification of next of kin. Authorities have recovered the body of a man who jumped off the Royal Gorge Bridge on Friday, according to a news release from the Cañon City Police Department. Police were called to the tourist attraction off Fremont County Road 3A just before 6 p.m. after the park's staff saw a man jump off the west side of the bridge. With the help of Fremont Search and Rescue, the body was recovered and handed over to the Fremont County Coroner. As of Saturday afternoon, authorities had not identified the man. 10.30.16: Royal Gorge Bridge jumper still not found. 07.20.16, canoncitydailyrecord.com, The individual who jumped off the Royal Gorge Bridge on Oct. 30 has still not been recovered. According to a news release from the Cañon City Police Department, surveillance video from the Bridge confirmed a person had jumped Sunday night. On Oct. 31, Park Rangers from the Royal Gorge Bridge called the police dispatch center reporting they had video of an individual jumping. Information regarding the individual and the incident will not be released until the person is found and family is notified. Mike Bandera, director of the park, said that this has been the second person to jump off the bridge to commit suicide this year. "It's definitely not a pleasant thing for management and our staff here," Bandera said, regarding the Bridge being a place people go to commit suicide. "We are aware of it daily," Bandera said. Bandera said the Royal Gorge Bridge averages about 340,000 people each year and the park averages one suicide jumper a year. He said this year they've had two incidents, and they had two in 2015, also. "1931 was when the first jumper was recorded, and since then, we've had the same average," he said. When asked if and how the Royal Gorge Bridge is addressing the issue, Bandera said they have looked into many options to try and prevent it from happening. He said that the Bridge has 13 security officers who patrol the park all hours of the day, and all security officers have been trained to recognize traits of a suicidal person and how to react when these situations occur. "We work against this possibility every day. There's no way to tell how many (suicides) we've prevented by just patrolling and talking to people," Bandera said. However, he said even with the training officers have received, it's impossible to find and stop everyone who enters the park with the intention of committing suicide. Bandera said they've been working with the CCPD and Solvista to train the park's officers and also to possibly work on signage they could put up. He said at this point, the most effective thing they can do to prevent this from happening is to have officers receive more training. Bandera referred to the Golden Gate Bridge as a location they've looked at; as it also suffers from individuals using it has a location to commit suicide. He also said they have looked into putting up a cage barrier or a net barrier. "Anything we put up would have to be metal so it couldn't be cut," Bandera said. However, a net would add extra weight and wind load to the bridge, possibly compromising the bridge's structure. Bandera also said visitors enjoy the views and vistas seen at top of the bridge. 07.19.16: Surveillance video confirms jump from Royal Gorge Bridge. 07.20.16, chaffeecountytimes.com, Cañon City police recovered the body of a man who reportedly jumped from the Royal Gorge Bridge at about 4:46 p.m. Tuesday. A press release from the police department stated that surveillance video footage indicated a man about 55-60 years old had jumped from the middle of the bridge on the west side. The Cañon City Police Investigation Team responded and was assisted by the Royal Gorge Railroad High Rail, Cañon City Fire Department and the Fremont County coroner for recovery efforts. Police said the man has not been identified but is believed to be from Colorado. Anyone who has information about the incident is asked to contact the Cañon City Police Department at 719-276-5600. 04.06.16: man jumps, body found 17 days later. The body of a man who reportedly jumped to his death April 6 at the Royal Gorge Bridge and Park has been found and identified. Jordan Loriss, 26, of Colorado Springs was found by Fremont County Search and Rescue on Saturday afternoon. Fremont County Coroner Randy Keller said that detectives with the Cañon City Police Department, the Colorado Springs Police Department, the Fremont County Sheriff's Office and Fremont County Search and Rescue worked to locate the body. A news release Monday said the body was located about two miles from First Street and the Royal Gorge Bridge. The body was about 30 feet out in swift water. According to a press release, authorities received a call at 3:30 p.m. April 6 after a witness reported seeing a man jump from the bridge. Keller said that Loriss' body was recovered in the Arkansas River. Teams conducted three searches on the river before they were able to locate the body. Keller said his family has been notified and Monday's news release stated the family had identified the body to be Loriss. 03.28.15: Person dies after leaping from 956-foot Royal Gorge Bridge. 03.28.15, denverpost.com, Authorities in Fremont County say a 42-year-old Boulder man leaped off the 956-foot-high Royal Gorge Bridge to his death on Saturday afternoon. The county coroner's office identified the man Monday afternoon as Marcel Staehelin. Police in Cañon City received a call from a person reporting that Staehelin had posted a suicide note on his Facebook page indicating he was on his way from Boulder to jump off the bridge. About four minutes after the call, officials from the Royal Gorge Bridge and Park phoned police to report that a number of visitors had witnessed a person leap from the bridge. "Officers from the Cañon City Police Department were able to locate a body near the bottom of the canyon," police said in a news release issued Monday. "Officers did descend into the gorge and did verify that the body was a deceased male and the clothing matched what witnesses had reported seeing on the jumper." Police say Staehelin's body was recovered late Saturday evening. The Royal Gorge Bridge and Park is a popular Fremont County tourist destination west of Cañon City. The bridge spans 1,270 feet across the Arkansas River and is 18 feet wide. 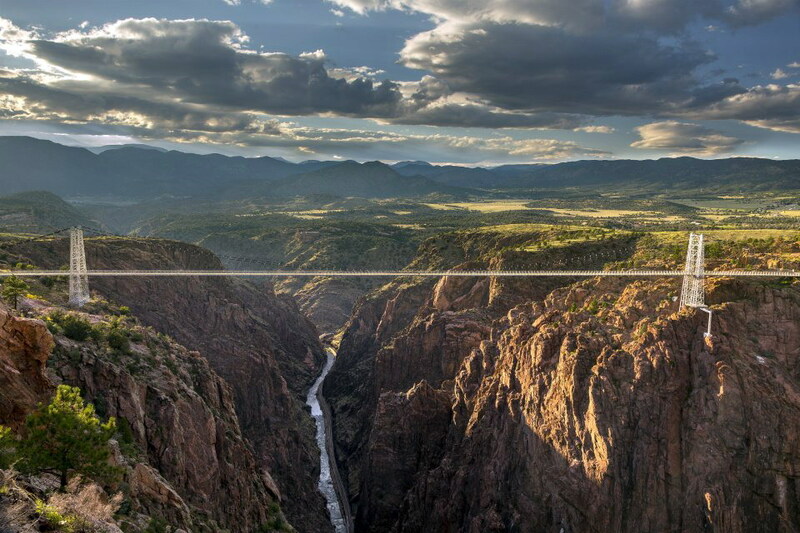 10.12.14: Person dies after leaping from 956-foot Royal Gorge Bridge. 10.12.14, chieftain.com, CANON CITY — A 52-year-old Littleton man jumped to his death from the Royal Gorge Bridge Sunday. The victim was identified as Thomas Wewior, Canon City police Capt. Jim Cox said Monday. Canon City police were dispatched to the bridge at 9:37 a.m. Sunday on a report of an apparent suicide. Security personnel had observed a male walking across the bridge and then noticed he did not complete his crossing, Cox said. The security officers then spotted what appeared to be a red coat and a body near the bottom of the gorge. Responding officers, Canon City firefighters, Fremont County coroner’s personnel and the security officers were able to locate and recover the body, Cox said. Further details were unavailable Monday. 09.05.12: Cañon City receives bill for recovery of remains from Royal Gorge Bridge jumpers. 09.05.12, canoncitydailyrecord.com, In the aftermath of three people jumping to their deaths from the Royal Gorge Bridge this summer, there is some debate as to who is responsible for footing the bill for recovering their remains. The City of Cañon City received an invoice from the Royal Gorge Express, LLC for $5,025 for recovering the remains of those bridge jumpers. The situation was discussed at length during Wednesday's general government meeting. Steve Kaverman, general manager of the Royal Gorge Route Railroad and representative for RGX, said the three separate incidents occurred March 6, March 14 and May 8. The latter incident required four separate trips into the gorge to find and recover the body, which was discovered a week later in the river by rafters. "It was the view at the time of the management of the Royal Gorge Express that these were exceptional circumstances and although there had not been a precedent in the past to seek any cost recovery for these kinds of efforts, the repeated occasions of this kind of incident occurring this year were different circumstances," Kaverman said. "It was felt that because of the specialized equipment and various other contingencies that we need to meet when we go onto the gorge for these kind of things that it was reasonable to submit an invoice for these incidences this year." The railroad uses specialized hy-rail equipment and staff who are qualified under Federal Railroad Administration guidelines. The $50 per hour billing rate is a blended rate that covers holidays, weekends and 24/7 availability and the $500 truck fee per service call reflects maintenance and operation costs. Mike Bandera, general manager for the Royal Gorge Bridge & Park, said a procedure was developed 11 years ago to handle suicides from the bridge. "Within that procedure, the train company volunteered to be the rescue vehicle because they wanted to avoid stoppage of train passage," he said. "They wanted to be called so they could get that hy-railer in there and get the body out." City Attorney John Havens said the railroad officials not only volunteered, but they insisted when the protocol was put together to be the recovery vehicle. Committee members and Mayor Tony Greer said they had no idea about the procedure and felt blindsided with the invoice. Greer said he is open to renegotiating the contract and suggested RGX consider putting a cap on the number of instances they provide for before billing the city or another entity in the future. "The last thing we want to be is hostile to businesses," Greer said. "If it's not working for you, we need to take another look at it." Bandera said the average number of suicides from the bridge is one per year during the last 12 years until this year. He said bodies also are occasionally transported from the bottom of the gorge via the incline. 10.05.03: Death of BASE Jumper Dwain Weston -- Slammed Full Speed Into Bridge.